Nathan Fletcher was once left for dead after his second failed mayoral bid. Now that he’s won a seat on the County Board of Supervisors, Fletcher will be expected to help deliver victories for progressives looking to bolster their ranks on a county board long led by Republicans. Five years ago, Nathan Fletcher, bruised and battered by both parties after his second failed mayoral bid, appeared left for dead. Now, boosted by labor groups and progressives, the former Republican assemblyman appears poised to become the sole Democrat on the county Board of Supervisors – and to keep fighting. Early results showed Fletcher was nearly 25,000 votes ahead of Republican former District Attorney Bonnie Dumanis just before 1 a.m. on Wednesday. Fletcher will replace Republican Ron Roberts, who served on the board for a quarter-century. Now that he’s won, Fletcher will be expected to help deliver victories for progressives looking to bolster their ranks on a county board long led by Republicans. 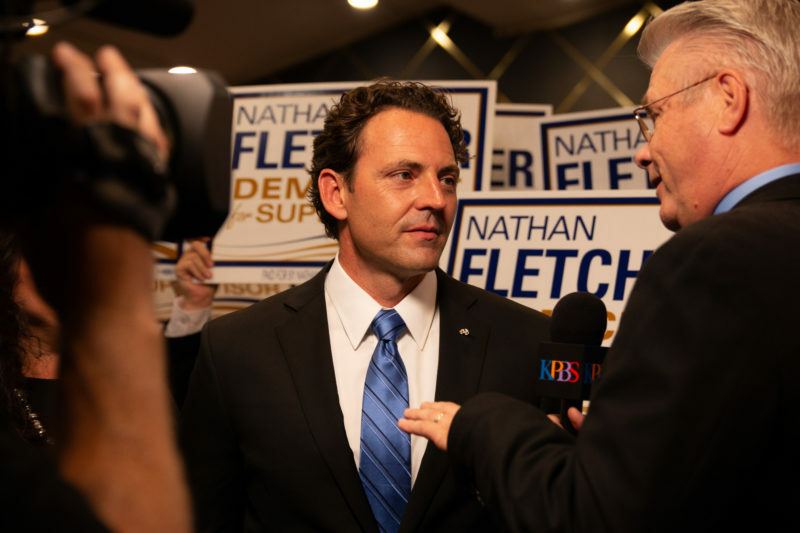 Labor groups and local Democrats worked tirelessly and poured hundreds of thousands of dollars into Fletcher’s campaign based on the belief that he can start to transform a county government that has for years prided itself on fiscal restraint. Progressives are counting on Fletcher to push the county to unload more of its substantial resources and to invest in increased aid for homeless and mentally ill San Diegans, affordable housing and improved county services. But for at least two years, the Marine veteran will be waging war on his own. Two more long-sitting supervisors will term out in 2020 and a third, Republican Supervisor Kristin Gaspar, is expected to face a tight race with a Democratic challenger. Progressives see at least two of the seats as pick-up opportunities in two years. Until then, Fletcher could simply be a thorn in the side of Republican supervisors or a deal-maker who occasionally manages to persuade his colleagues to join with him on specific issues. On Tuesday night, after results showed him far ahead of Dumanis, Fletcher sought to temper expectations before a packed hall of Democrats. Fletcher’s advocates also acknowledge the next two years won’t be easy. Yet Gloria, who successfully pushed a ballot measure progressives hope can help pave the way for future Democratic wins on the Board of Supervisors and in other countywide races, is hopeful. He believes Fletcher’s track record as a deal-making Republican moderate while he was in the Assembly shows he’s capable of making inroads. Former County Supervisor Pam Slater-Price, a former Republican who switched parties herself last year, is less convinced Fletcher can make a significant difference at the county his first couple years in office. “It’s really kind of a crapshoot at this point,” she said. After all, success in the next two years will depend on Fletcher’s ability to work with Republicans – and their willingness to work with him. Slater-Price sees an opening for Fletcher to occasionally partner with Supervisors Greg Cox and Dianne Jacob, both of whom will be termed out in 2020, if he can seize on issues that matter to them. Jim Desmond, a Republican who appeared poised for victory Tuesday night, could also be a potential ally for Fletcher. Whether Fletcher can cut deals or not, many of his supporters look forward to having a Democratic insider to question county policies that don’t align with progressive values. They believe even simply highlighting the county’s current practices could help Democrats in 2020. One of the Democrats cheering Fletcher on is termed-out City Councilman David Alvarez, who has begun raising cash for a potential 2020 bid for Cox’s South Bay seat. “I think the general public is starting to get a sense of how wrong the county is in terms of what it’s not doing, and I think Nathan can do a fabulous job of exposing that,” Alvarez said. Republicans aren’t eager for Fletcher’s newfound megaphone or any future wins he might eke out in the next two years or beyond. Fletcher has pledged to serve two four-year terms as supervisor. This fall, he told the Union-Tribune that he won’t run “for anything else other than re-election of the Board of Supervisors” in the next eight years. But many Republicans suspect Fletcher, who also has two unsuccessful bids for mayor under his belt, will seek higher office and they don’t want to help his chances. Brian Pepin of the right-leaning Lincoln Club, whose PACs sunk nearly $450,000 into opposing Fletcher ahead of the June primary, doubts Fletcher will follow through on his commitment. Mitch Mitchell, vice president at San Diego Gas & Electric who helped persuade some key figures in the business community not to go all in on attacking Fletcher, said he believes the Fletcher’s mayoral losses have informed his approach to the county seat. “One thing I see in him today that I didn’t see in him in previous runs: He understands the taste of defeat and he understands that he has to once again prove himself and convince people that he can be an effective leader in an elected position because his tenure in Sacramento was a long time ago,” Mitchell said. Fletcher said Tuesday night he’ll be most focused on using the office to help those who are most vulnerable. Disclosure: Mitch Mitchell is a member of Voice of San Diego’s board of directors.